Galvanized Round Tub - 65L. They have handles that make it easier to move them from place to another in the garden. The dimensions are perfect for plants that grow horizontally. 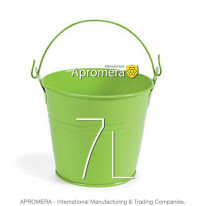 Galvanized Round Tub made of high grade iron sheets, which work towards decreasing the weight of the planter, but providing the right amount of safety that a growing plant would require. 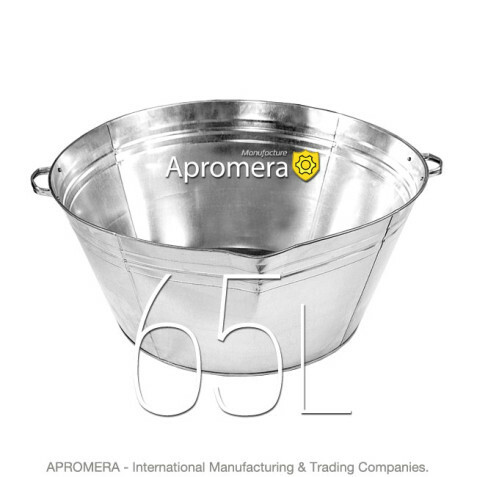 Apromera Designs, a Garden Manufactyre company, emphasizes unique, handforged, Galvanized metal, European furnishings for the home and garden. 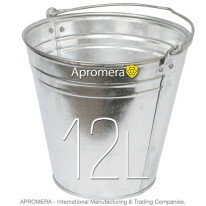 This versatile, handmade tub is watertight. All our products are stocked in our warehouse for year round, prompt shipping. 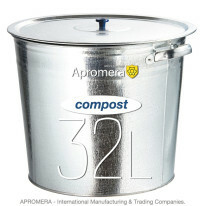 Apromera Designs continues to add beautiful and unique items year after year, resulting in an unusually large product line. We produce Galvanized Round Bath of steel with a thickness of 0.55 mm. -0.60 mm. Such production is considered to be a standard quality. It is more resistant to deformation and outside influences. Handles type №1. 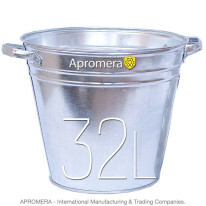 The handles of the Galvanized Round Tub is made of 0.55 – 0.65 mm steel. This increases the lifetime of products and their capacity.